Robertson's announced 5,000 Gold Farewell Badges were issued in 2001. Of these 150 went to Riviana - Robertson's Australian distributor...but which 150? The range is being narrowed down. If you have a Farewell badge - please let me know the number and whether you bought it directly from Riviana (Australia) or Robertson's (UK). It doesn't help if you don't know it's origin! 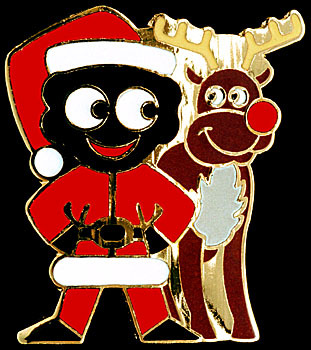 Robertson's announced 10,500 Santa and Rudolph Badges were issued in 1998. Of these 500 went to Riviana - Robertson's Australian distributor. In this case the Australian badges had numbers at the end of the run i.e. greater than 10,000. If you have a Santa & Rudolph badge - please let me know the number and whether you bought it directly from Riviana (Australia) or Robertson's (UK). It doesn't help if you don't know it's origin! People from the UK and Australia have supplied me with their badge numbers to determine which numbers went to which country in order to create the above charts.Thanks to everybody on the Yahoo! Group GollyBCII and to those who emailed me their badge numbers.